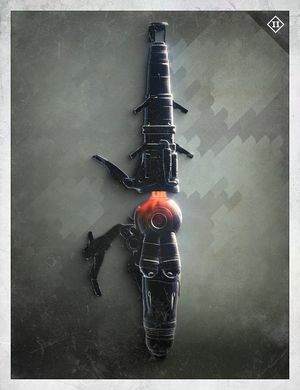 The Scorch Cannon is a Fallen relic weapon found throughout the Destiny series. The Scorch Cannon acts as a Solar-damage rocket launcher with ten rounds. Holding down the trigger converts the rockets into sticky bombs, which become more powerful with time. An unprimed explosion will kill most weaker enemies. A fully primed bomb will kill a shielded Major, but not an Ultra. The bombs will stick to both surfaces and enemies. In Rise of Iron, the Scorch Cannon made a return with new variants, the Shock Cannon and Null Cannon. Scorch Cannons are shoulder-mounted heavy impact weapons used by the Fallen for hull-puncturing in ship-to-ship raiding parties. The Scorch Cannon uses a compressed Solar "furnace" to focus and direct superheated rods of solar energy. Each burst is mapped to the Cannon's firing matrix, allowing the wielder to hold a fired rod's charge. Release of the firing actuator triggers detonation. The longer the actuator is held the greater the rod's explosive impact. Patrol—Scorch Captains that appear during a "Pack of Wolves" world event will carry one of these, and will drop it upon death. Certain Wanted Captains will also carry these. They also appear in the European Dead Zone Patrol. The Shadow Thief—Taniks, the Scarred carries a Scorch Cannon, and will drop it upon death. Prison of Elders—available as a potential gift from Variks, the Loyal. The Devils' Lair—after killing a Splicer Scorch Captain, a Scorch Cannon will drop. It is the only way to bring down Sepiks Perfected's Solar shield. However, this particular model has only one round after being picked up. Arsenal Walker Heroic Public Event - Retrieving the charges dropped by damaging the walkers and using them to destroy the shield generators in the area will unlock caches of Scorch Cannons, while triggering the Heroic version of the event - spawning a second walker. Screenshot of the Scorch Cannon in a Guardian's hands.